​I have observed many fields of cantaloupes with magnesium deficiency or manganese toxicity. 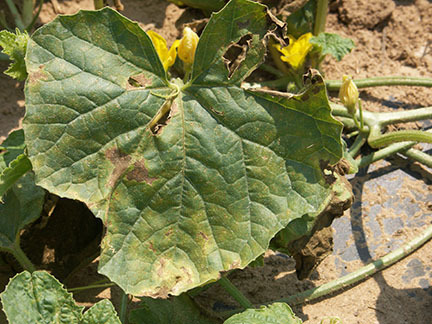 Watermelon plants may exhibit similar symptoms, but not as frequently as cantaloupe. Both disorders are related to acid (low pH) soils and usually occur in clusters in a field. Magnesium deficiency usually appears on sandy ridges and can be recognized by interveinal yellowing and death of tissues on older leaves (Figure 1). Manganese toxicity also first occurs on older leaves but appears in heavier or darker sands, often in low areas of the field. The diagnostic feature of manganese toxicity are the tiny pin-hole type lesions with yellow halos clustered between the veins (Figure 2). Leaves are best viewed when held up to the sun. These disorders can easily be confused with an infectious disease. 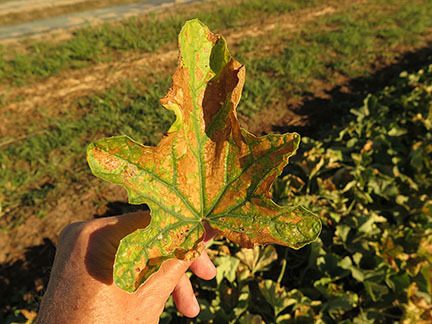 In particular, magnesium deficiency has been confused with Alternaria leaf blight. Symptoms may seem to “spread” from areas of the lowest pH to areas of somewhat higher pH. Individual rows may seem to be worse than adjacent rows. Such rows may have received less lime. The remedy for these disorders is to raise the pH of the soils involved with a lime that contains magnesium (dolomitic lime). This can be difficult to accomplish with crops growing under plastic mulch, because of the difficulty of getting the lime into the root zone. Magnesium deficiency alone can be alleviated by supplying a magnesium containing fertilizer. Although growers may have soil tested and spread lime before the season, the heavy rains we have had over much of the state this year has led to many areas with low pH. In addition, wet conditions can increase the likelihood of manganese toxicity because manganese is converted to a more soluble form in saturated soils. Learn the symptoms of these disorders so you won’t be wasting fungicides on a nonexistent disease. Additional discussion of manganese and magnesium may be found in Issue 585 of this newsletter. Magnesium deficiency in cantaloupe. Manganese toxicity in cantaloupe.